Judith McNaught’s romance novels are to die for. It portrays worlds of elegance, passion, intrigue and love like no other author can. Almost all romance book readers are avid fans of her books. Judith McNaught started out with the book Whiteney My Love, a historical romance book and went on to write contemporary stories of which her latest novel has been Every Breathe You Take which was released late last year. I have read all of her books except for the book Water’s Edge which has a shroud of mystery surrounding it since many books portray its advertisements but I have never come across the book in any bookstore nor in any e-stores such as Amazon.com which sells almost everything. I read from somewhere that the Water’s Edge never was published but the original story line for Water’s Edge was modified and finally was released as Someone to Watch Over Me which was released prior to her latest novel. 1. Whitney My Love: The adventures that Judith MacNaught takes us on through in this book makes it an enjoyable read. Whitney as a child feels as she should make up for the fact that her father doesn’t have a son and engages is all such activities to make her father proud which has the reverse effect in fact. She falls for a guy named Paul and goes out of her way to impress him and fails miserably. Her aunt and her husband, summoned by Whitney’s father comes to take Whitney away to Paris where she grows into a beautiful woman courted by all eligible men of the ton. The story starts when the Duke of Claymore purchases Whitney as his bride without her knowing about it. Sparks begin to fly but the undeniable passion that flares between Whitney and the Duke becomes Whitney’s undoing..
2. Until You: Featuring Whitney’s husband, The Duke of Claymore’s younger brother Stephen Westmoreland, this is an enjoyable read packed with romance, passion and intrigue. There are times when you are so happy you tend to smile and cry with frustration and sorrow at what they both go through to come out victorious in the end. 3. Something Wonderful: The tempestuous marriage of Alexandra Lawrence, an innocent country girl, and Jordan Townsende, the rich and powerful Duke of Hawthorne, is about to face its ultimate test of tender loyalty. Swept into the endlessly fascinating world of London society, free-spirited Alexandra becomes ensnared in a tangled web of jealousy and revenge, stormy pride and overwhelming passion. But behind her husband’s cold, arrogant mask, there lives a tender, vital, sensual man…the man Alexandra married. Now, she will fight for his very life…and the rapturous bond they alone can share. 3. 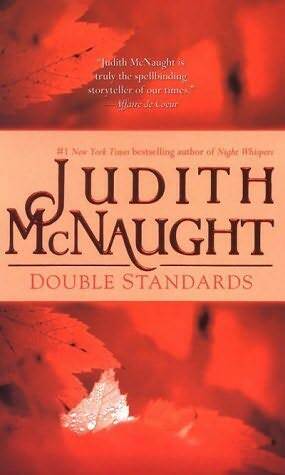 Double Standards: One of Judith McNaught’s forays into contemporary novels, makes for quite an exciting read. The ruggedly handsome president of Global Industries handled his business the way he handled his women-with charm, daring, and ruthless self-control. A man used to the very best, Nick hired Laura Danner, and assumed that the proud beauty would soon be another easy conquest. But Laura’s flashing wit and rare spirit dazzle him-and slowly, against his will, he was intrigued, challenged-and in love. Yet Laura was living a lie, a charade that became more dangerous with every passing moment. Trapped in a web of deceit, she fought her growing love for Nick. Her secret could destroy his fragile trust-and the promise of life with the most compelling man she had ever met! 4. Paradise: One of the most enjoyable novels by Judith McNaught, contemporary style. I nearly cried at the pain, betrayal and injustice and finally the love the hero and heroine find together. Meredith Bancroft is blonde, beautiful, successful – and alone. She remains mysteriously aloof from the Chicago society in which she circulates. Her secret lies with dynamic tycoon, Matthew Farrell. 5. Perfect: This story is just Perfect. A must read for all romance readers.. Julie Mathison has constructed a perfect life for herself. Nothing and nobody can destroy her happiness – until she meets the man of her dreams. Zack Benedict is on the run, accused of murder. Desperate to prove his innocence, he uses Julie as a pawn in a dangerous game. 6. Someone to Watch Over Me: Leigh Kendall reveled in her Broadway acting career, and her marriage to Logan Manning, scion of an old New York Family. When her husband finds an old country cabin, he decides to build their dream house and surprise Leigh with her first view of the mountain property. Following a Sunday night performance, Leigh heads north to join him, but is run off the road fighting the elements of a blinding blizzard. When she awakes in the local hospital, seriously injured, she asks for her husband. The police arrive to inform her that he has mysteriously disappeared, and Leigh, although obviously distraught, becomes the focus of their suspicions. Leigh plunges into a desperate search to find him…and into a menacing web of secrets, deception, and danger. The more she uncovers about her husband and his business affairs, the less she realizes she knew about Logan Manning. Now, with no one to help her, she is heading deeper and deeper into unknown territory…where friends and enemies are impossible to distinguish, and where the truth becomes the most terrifying weapon of all.